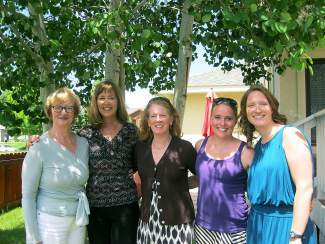 In early June, Representative Millie Hamner visited current and former ECSD teachers and Delta Kappa Gamma members (a local teacher's organization) at Roxie Carreon's home in Eagle. It was âa blast from the pastâ during the luncheon with Hamner. Many stories were shared and loads of laughs were had during the fun and informative afternoon. Thank you, Millie, for visiting our local DKG chapter and explaining current educational legislation you are working on and for your dedication to Colorado students and teachers.